Next month marks my 60th birthday. And to celebrate this monumental year I wanted something special for myself. And I didn’t want a present that was like any conventional present given in the past. I already have a nice pair of binoculars and spotting scope with a nice tripod, so that’s out. I love my camera with all the gadgets I bought with it, so why would I buy a new camera. Granted a birder could always use more field guides and other books relating to birds, however this being my 60th birthday it had to be something special. And I can’t think of anything that gets a birder more worked up and all twitchy, and eventually puts a huge smile on their face than new life birds. Now if you’re a birder you know what I mean when you see a new bird to add to your life list. It’s a true thrill and the memories associated with it lasts forever. For the past 3 years I’ve been dreaming of the day when I could attend the Rio Grande Valley Birding Festival. The RGVBF is world famous. The tours take you to places you only dream about. And the birds! Species that leave your mind numb and your eyes fatigued. Bring it on. Every year I’d go onto the festival web site and read over all the tours that’s being offered and thinking that one day will come when I’m on those bird tours. Dozens of new birds to add to that stagnant old life list in hopes of hitting 400 birds. So yesterday I made my hotel reservation. I have a good idea on which tours I’m going on. Late afternoon free lance birding by myself is coming together with help from Jon. Except for booking my flight and rental car and signing up for my tours in July I’m starting to study my birds and watching feeder cams at Sabal Palm Bird Sanctuary. Which is pretty cool. So as the weeks tick away and November rolls around I’ll be updating you as my itinerary develops. And if you think that I might be jumping the ball by planning this far out. Well that might be true, but you see when I booked my room yesterday I got the last single room in the hotel I’m staying at for those 6 days I’m there. The thermometer was reading in the single digits as I backed the bird-mobile out of the garage and pointed it towards Voice of America Park to meet up with Jon for a morning of river birding. If my memory is correct it was last year when Jon and myself birded together, so this was a long overdue trip. The reason we meet at such an unusual location was to be as close to I-75 so we could then make our way towards Dayton. For the past few weeks it’s been one of the go to spots for unusual Gulls, other than Lake Erie. Great and Lesser Black-backed, Iceland and Glaucous Gulls have been seen with regularity, so not wanting to be left out we made our way north. 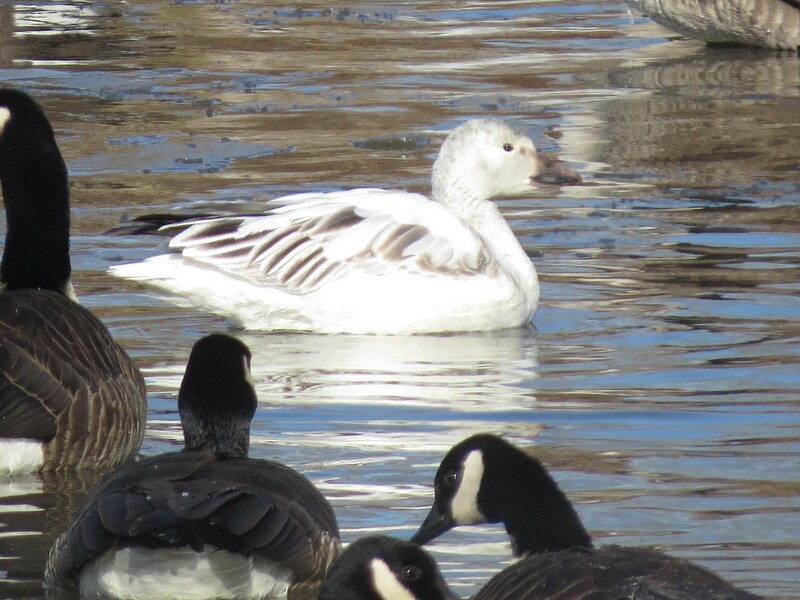 This recent cold snap has left little if any open water on most lakes and ponds, so finding open water is pretty important for both waterfowl and gulls. Now there’s plenty of rivers that probably has open water where we live, but the reports coming out of Dayton can’t be ignored. 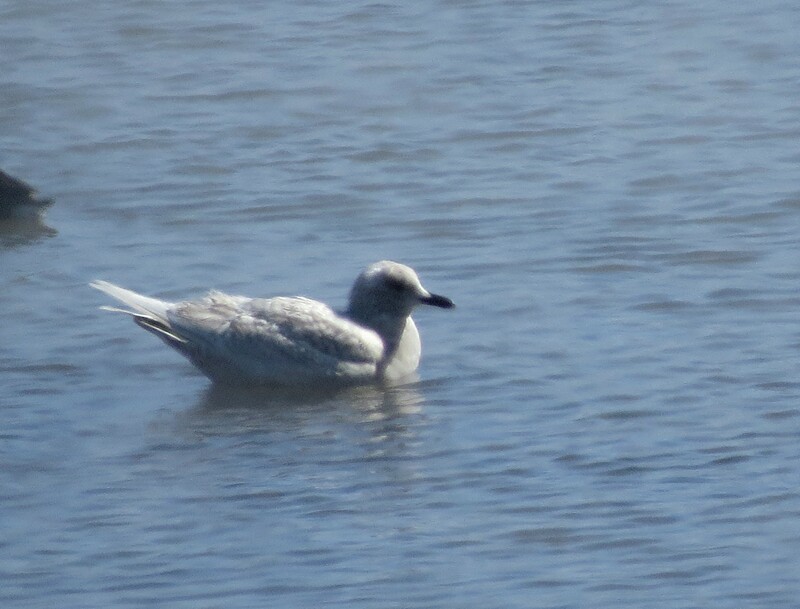 Plus I found out later Jon hasn’t got Iceland Gull on his life list, and the most recent sighting was 10 days old. I was familiar with where the Iceland Gull was seen by a local birder both myself and Jon know, so that’s where we went first. Great Miami River looking downstream. We pulled onto River Road in Dayton and parked at a small college lot. Walked across the street and was greeted with loads of gulls and ducks and geese. 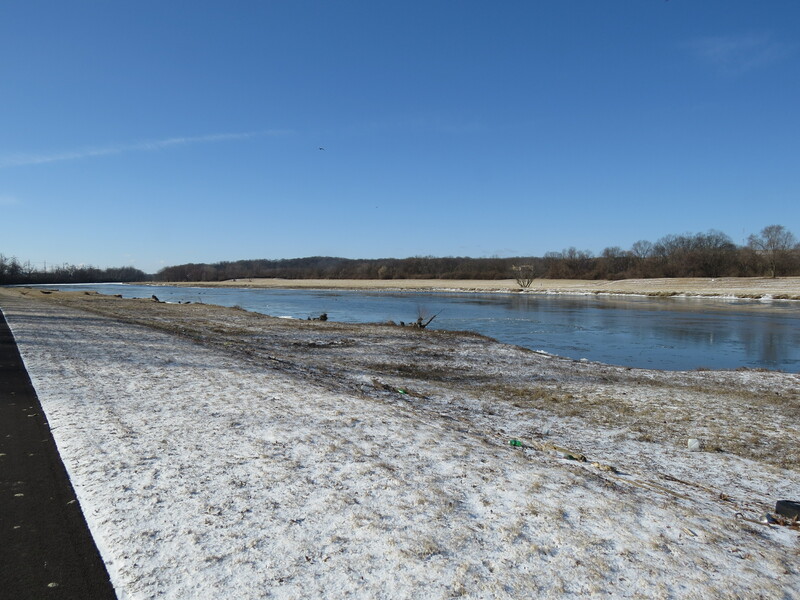 This section of the Great Miami River doesn’t freeze over as fast as other sections due to a treatment plant inflow and another small stream which keeps the water flowing. We hit a couple more spots along a half mile section of river just south of the city. 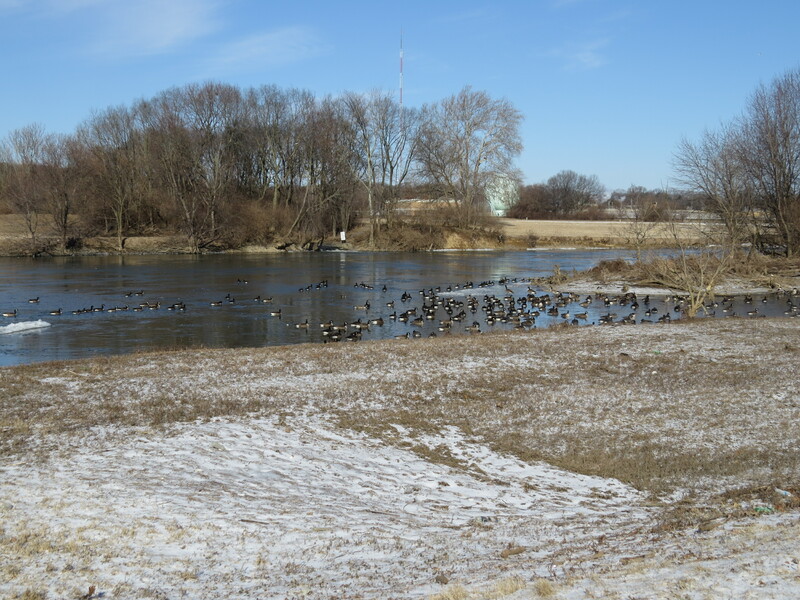 Common and Hooded Mergansers, Common Goldeneyes, and plenty of Ring-necked Ducks were the prevalent species. Then we moved to a spot across the street from the University of Dayton Arena. Iceland Gull (Larus glaucoides) is most commonly seen along the Atlantic Canadian and Northeast region of the United States. But they do wander. 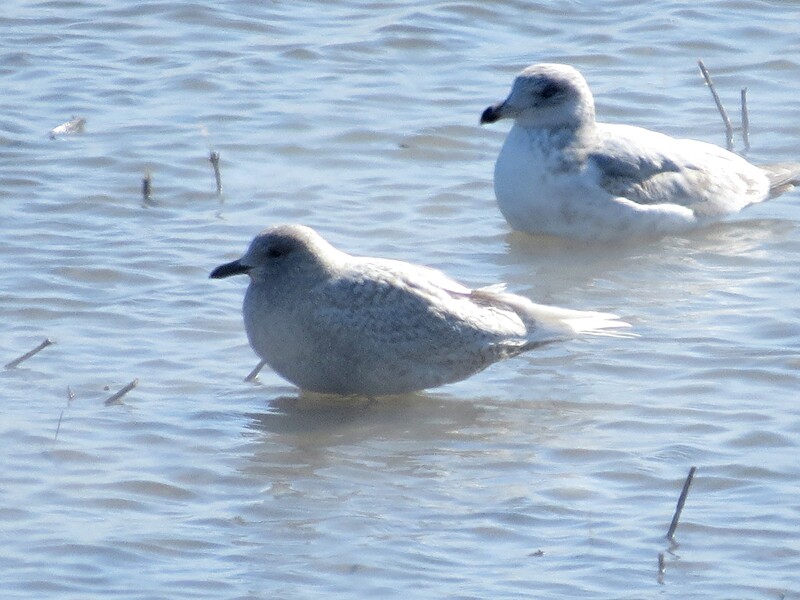 And for the most part us birders in the Southwestern part of Ohio know that if you want to find an Iceland Gull is to go to Lake Erie in the Winter. 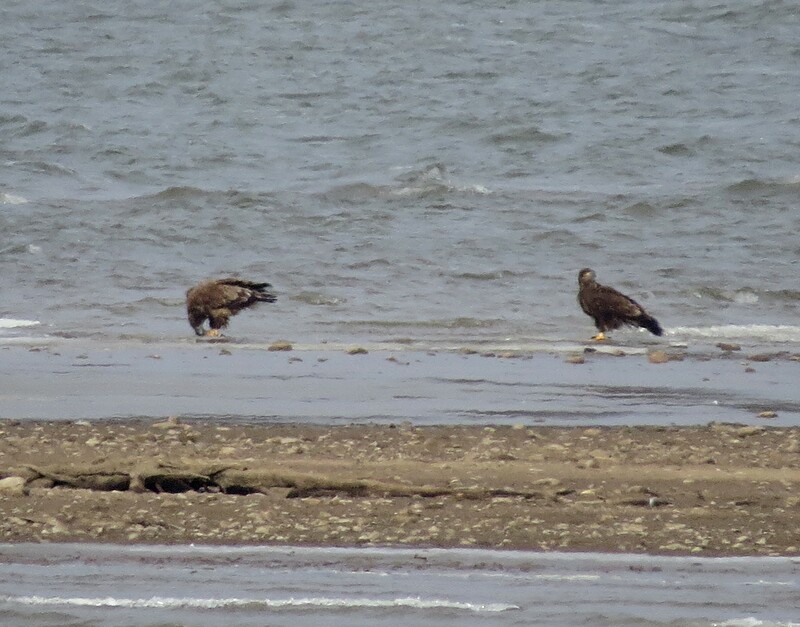 A little bit smaller than a Herring Gull, but larger than a Ring-billed Gull, we had our job cut out to find this bird. A small, slender bill, pink legs, and primaries that extended well past the tail were key field markings we need to key in on. As we scanned the gulls, it was Jon who first said, “I have a gull with no black wing tips”. I got on the bird. Damn, gotta run back to the car to get my camera. Age and absent-mindedness reared it’s ugly head as I searched frantically in Jon’s car for my camera. We had to leave the gull and back track to try and locate my camera. After 15 minutes of heart stopping anxiety I finally found it where I left it by the river. Quick, have to get back to the Iceland Gull. And in typical form, a crappy picture. The sun was in the worst spot in the sky, hence the glare. 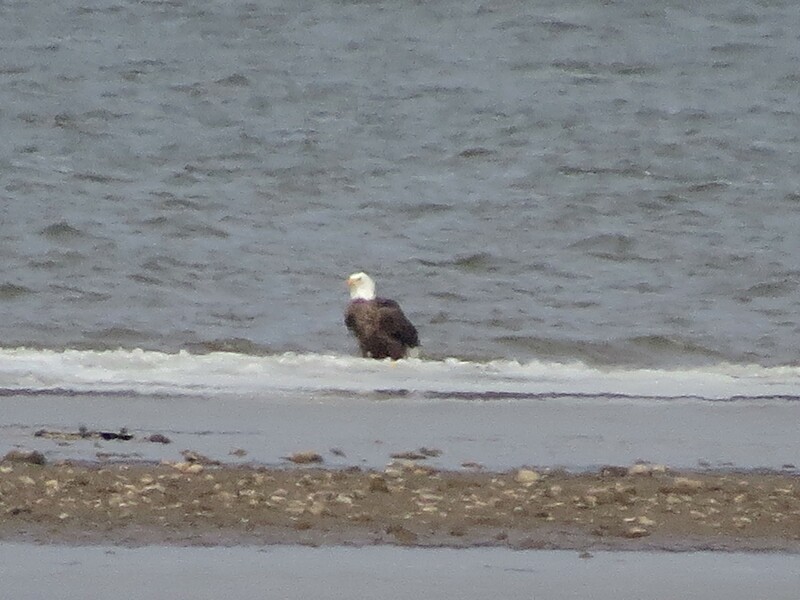 Plus I had to use the digital zoom to get even close for a picture. But there he/she is. A 1st winter Iceland Gull. With this picture you can see how the primaries extend past the tail. So if you happen to live within a 30 minute drive or so of Dayton, check out the Great Miami River. As I write this post more Great Black-backed Gulls are being seen. Great spot. Between the years 1917 and 1952 the bounty on Eagles in Alaska claimed the lives of 128,000 Eagles. The actual number probably exceeds 150,00, and those extras were bounties never collected. At one Wyoming ranch, according to a 1970 report, 770 Bald Eagles were shot because of the perceived notion that Eagles were a threat to their livestock. So with the Bald Eagle Protection Act in place one would think that everything would be alright. Wrong. Let’s not forget about DDT. In 1962 Rachel Carson wrote a book titled Silent Spring. In it she exposes the devastation this chemical was having on wildlife. And Raptors were particularly vulnerable since they were higher up on the food chain. The effects of DDT on eagles was so horrible that in 1963 there was only 417 pairs of Bald Eagles left in the lower 48 states. And in typical bureaucratic fashion (where speed isn’t their strong point) it was finally banned in 1972. However good news was on the horizon, when in 1978 the Bald Eagle was listed under the Endangered Species Act as endangered in 43 of the lower 48 states, and threatened in the rest. In 1995 the U.S. Fish and Wildlife Service downgraded the Bald Eagle status from endangered, to threatened. And the numbers kept on rising. So you may ask yourself why am I going on about the Bald Eagle with all these facts and dates. 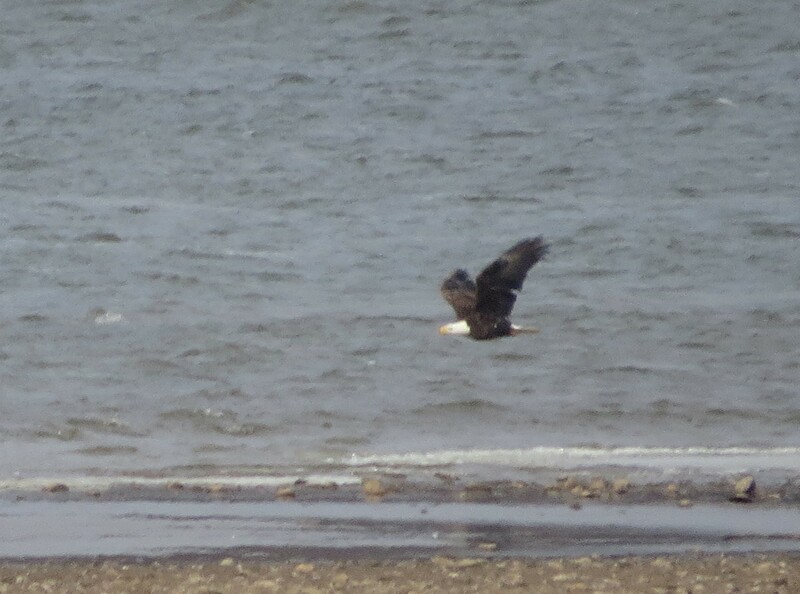 Well it turns out I had a special kind of encounter with the Bald Eagle just this last Sunday. My morning started of at Spring Valley following up on good reports of both Winter Wren and Virginia Rail sightings. Having not been to this section of Spring valley before I really took my time in working the area, coming up completely empty on the target birds. I hit up several more stops as the morning waned, adding more birds to the day count. The past few days has been unseasonably warm and some of the large gravel pits I stopped at showed signs of the ice breaking up. With this little bit of knowledge I hurried off to Harveysburg Road to check out Caesar Creek Lake. I pulled into my normal spot, grabbed my scope and wandered down towards where the road dead ends at the lake. The lake level was real low. Probably because of the construction of a new marina. The ice had definitely melted. So much so that only along the shore line out maybe 20 yards was there any ice left. And it was along this demarcation of ice and water when I saw 2 Bald Eagles standing on the icy edge. An adult and a juvenile. I trained my scope on them and watched. Then another juvenile flies in. Now we have 3. Pretty outstanding since this is the most I’ve seen at one time at this lake. Then a 4th juvenile shows up. Holy Cow! Grab the camera and lets get some crappy photos. One thing to remember these birds were real far from where I was standing. Unfortunately I wasn’t able to get all 4 in one shot. 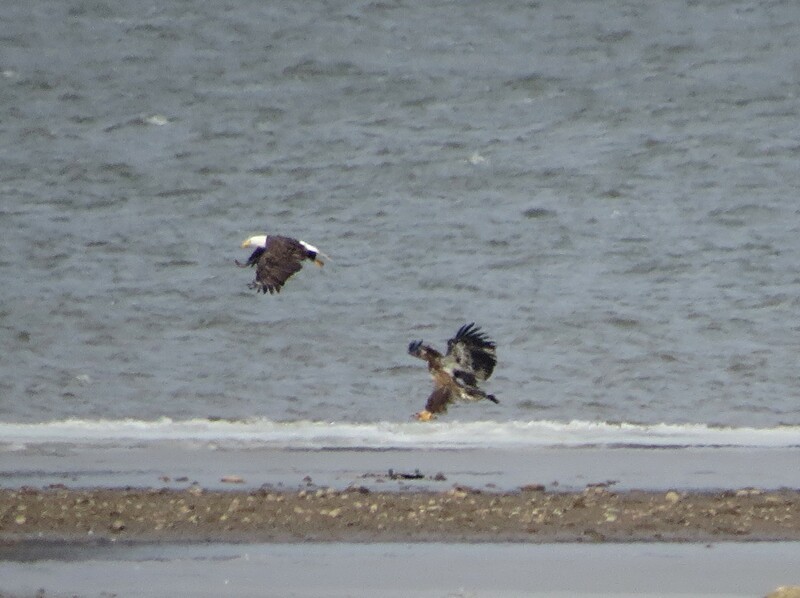 You see when the 4th eagle landed, they all got kind of skittish and started to disperse. Thank God for intelligent people who put forth the effort to save these absolutely beautiful creatures. In the early 1970’s when this stamp was issued in a block of 4 wildlife conservation stamps which included Big Horn Sheep, Fur Seals, and believe it or not the Northern Cardinal, that deadly pesticide DDT was devastating the Brown Pelican population so much that to draw attention to this problem the U.S. Postal service thought it was necessary to issue a commemorative stamp. Now a days if you’ve ever been to Florida you’d never would have thought such a problem existed. These effortless fliers were a sight as I would just stand on the beach and watch as as they glided over the surface of the water. 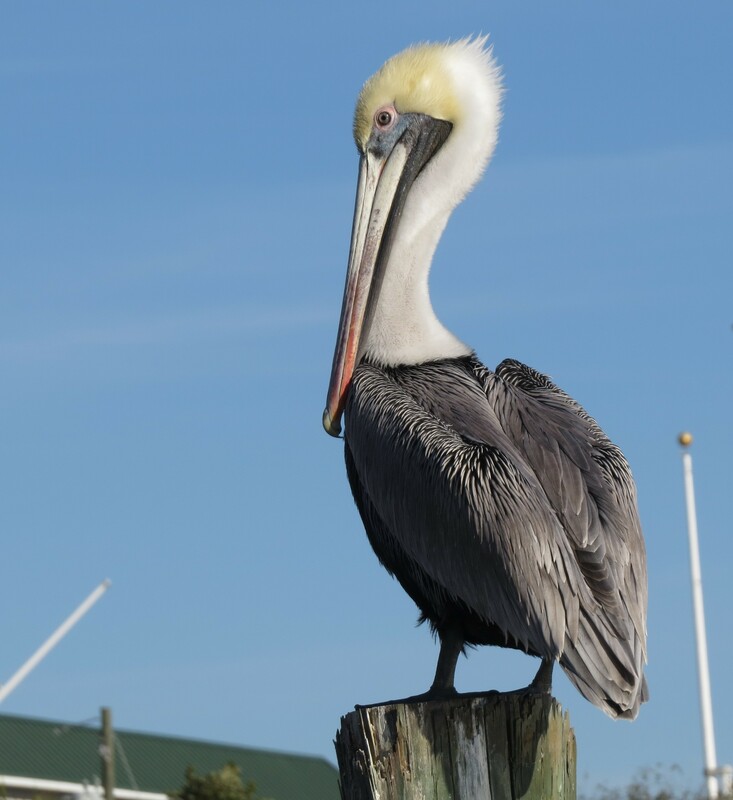 So on my most recent trip to Florida I made it my project to try to get a photo of a Brown Pelican sitting on a support post of a dock. Your typical Pelican pose. But where do I start this search for this perfect location? Most places on the waterfront are either privately owned or just too difficult to get to. I needed something simple. So it was one evening while at dinner at one of our favorite seafood restaurant when I noticed the Pelicans down by the waterfront and on the docks just 20 yards from the restaurant. Perfect. How could you not love that regal look of these wonderful birds. I just can’t imagine losing these birds to something like DDT.